Welcome to the Flash Friday Series! Each Friday, we share something personal: A personal goal, achievement or some way we find to achieve balance in our harried, busy professional lives. For those of you who know me, you know I like to play as much as I like to work. It’s the stuff that keeps us sane and alive. I hope this series inspires you. And? If you have a story you’d like to share, please contact me here. Balancing wellness and work. It’s a tough, but necessary issue I wrestle with frequently. Recently I signed up and ran a Tough Mudder. I did this partly on a dare, and partly to ensure I’d go to the gym and train. This was important because of the intense amount of work I fielded this Fall: We became a single income family over the summer, which required me to take a more serious work approach while balancing the joy of parenting. Also, I was preparing for a TEDx speech. So why add another thing? I don’t know what it is about me and the way my head works, but working out actually helps me manage time. I’m better able to handle tasks, stress, and presence. 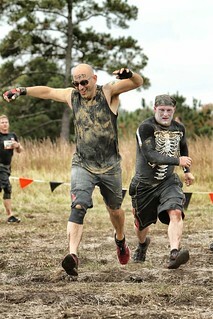 The Tough Mudder forced me to train because it’s such a brutal course. The endurance of running one-half mile, stopping, and engaging in an obstacle, then picking up a run again — again and again over an 11-mile course — was demanding. Even after working out for six weeks with an extra tough regimen of running, biking, swimming, stairmaster, and free weights, I was taxed. But it kept me physically balanced, and I got the work and home results I needed, too. First, business went very, very well during this timeframe. I am in the midst of my best quarter ever as a solo entrepreneur. Even though there were some kinks I’d like to work on with my speaking style (namely pacing across the stage) during my TEDx speech, I felt it was the best I had ever given. It was an 18-minute speech given completely from memory with two umms total. Finally, my family life seemed to even out a bit as we re-adjusted to our new roles, and how that impacts life. 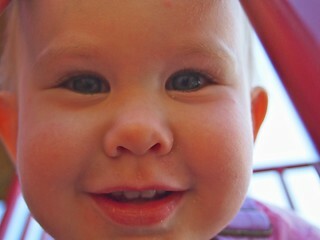 My daughter Soleil turned two, and she is just a peach. Sleep and eating well matter in the work/life balance equation, too. It’s one of the reasons I am currently maintaining a five-day a week vegetarian diet. Basically, I eat meat two or three days a week to ensure I’m getting protein, but that’s it. And I always feel comatose after I eat meat. Lastly, there’s sleep and rest. I always feel better rested, who doesn’t? This is a big area for me to focus on over the next few months. I’m not writing or heavily promoting a book currently, the first time in two and a half years. It’s important to recharge the batteries during this lull. Rest is by far the one area that I skimp on. Look, balance is very, very hard. I’m definitely a Type A driven worker. I always have been; which means I’m always skimping on self-care in some way. Do we ever achieve perfect balance? More than likely no. But it’s something to strive for, and it takes constant tweaking as life priorities and needs change. How do you balance your personal life so you can be the best you can at work? Geoff Livingston is an author, public speaker, and strategist who helps companies and nonprofits develop outstanding marketing programs. He brings people together virtually and physically for business and change. I employ a couple of strategies because I’m a Type A person, too. I can work and work and work. It’s not good (My last year in college brought home that reality.). These days, I have boot camp. I go at least once a week but strive for twice. I also run on Saturdays (Eight miles this past one! Yes!). I also have one night that I spend with friends. On Sundays, I try to rest. I go to church, then I come home and work on a poem. Routines are best to keep that on track, aren’t they? I love that you work on a poem!! Do you write one every week?!?!?! I usually do. I miss here and there, but the aim is to write at least one poem per week. I have to – I publish a new poem every Friday on Tumblr. Some of the poems aren’t great, but the act forces me to get my work out there. I have actually stopped writing the past week every day, just to take a break… Sometimes just stopping is important. I find I am writing every third day compulsively, but since I am blogged out through December, I figure a break was in order. Rest. Rest!!!! I don’t have time to write every day any more, so I write compulsively – to borrow your word – when I do write. I like to have about two weeks worth of posts in the queue. It keeps me from panicking. Sometimes, stopping is essential. I’ll have to find the post at Bill and Dave’s Cocktail Hour. They talk about stopping in one of their bad advice columns. Thanks! You can blame Michael Schechter for that initiative. He hounded me for weeks about publishing my poetry. I finally caved when I decided that Tumblr could make business sense. I’m going to go find you over there! First, thanks, Geoff for being the guinea pig on the Flash Friday. 🙂 And I’m so happy I got to use a photo of Soleil on the blog – would you just look at that face? That sounds awesome!! I may have to fly out there. I have the same goal actually, and am going to run another mudder this spring with the goal of finishing under 3 hours. I need to get my knee repaired (pre-Mudder injury), so this will force me to rehab, too. YOU SHOULD FLY OUT HERE!!! You’d actually fly to Seattle, then it’s a four hour drive. Sort of a hike, but well worth it, and the area is fantastic for a long weekend if you can swing it. Gorgeous place. OMG – you are a glutton – another mudder? Balance? What is that. I work too much, sleep too little and talk a good game about making the adjustments that will end the vicious cycle. Actually I can measure my productivity against how often I play basketball. When I play 2-3 times per week I am better in every area of my life, without exception. That adrenaline rush just carries over. That is a great measurement mark. Love that! I need to work out 5x a week to make that goal! That is definitely a good metric! I, uh, have never been accused of not sleeping enough. I HAVE to have sleep.